These ships were built between 1942 and 1945 and were fitted with magnectic acoustic, and mechanical sweeping equipment. It would seem that this class of ship developed from the Halcyon class of minesweeper of the 1930's still retaining some of their general appearance. These ships, having been built in the U.K. and Canada, later served in the Canadian and most Western Alliance Navys. 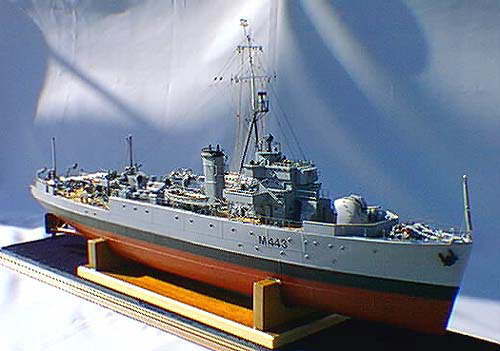 The model is based on a plated fibre glass hull. All decks and superstructure are in 1mm printed plastic sheet format with turret, funnel, boats etc in vacformed plastic. Weapons and fine detail fittings are in cast in light alloy, and all larger items are cast in lightweight plastic. Stanchions and ladders for that extra fine detail are in etched brass. Propshafts and tubes are included in this kit along with the rudder and tiller arm. THE FULL SIZE PLAN is from the D McGregor range. With its twin screws and twin motors and short length/beam ratio this makes into one of the busiest little models in our range and she has all the outstanding handling qualities of her bigger and full size sister. The close range weapons fit on this model are 4 40mm bofors guns. The kit contains a comprehensive set of instructions.